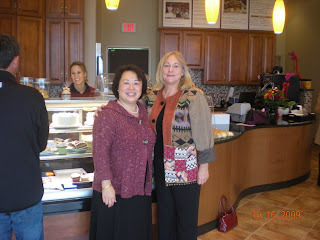 Eileen & I just got back from a most delicious lunch at the Grand Opening of Cakes By Happy Eatery in Manassas. Today was their very first open day, but you would not have known it ~ they were very organized, and our sandwiches were excellent! And of course we couldn't leave there without bringing back a box of exquisite sweet treats for everyone at Dominion. Yum! 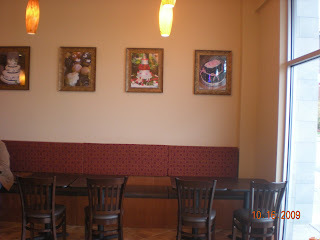 Eileen helped the owner, Victoria, with all of her lighting needs, as well as some of her general design decisions. They did a fantastic job ~ look how beautiful it is! Look at the delicious treats! And don't forget the beautiful lighting by Besa. I loved the framed "portfolio" pictures. 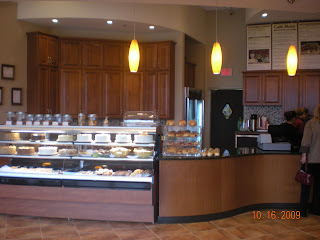 They also have a Centreville location where I had helped with lighting several years ago. That address is 14200A Centreville Square, 20121 (703) 988-9688. 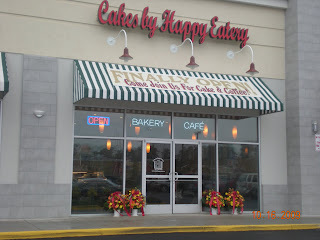 And their website is www.CakesByHappyEatery.com. Enjoy!